Lean Six Sigma Green Belt methodologies is the most popular data centric approach to improvise a process. Six Sigma is a combination of theoretical aspects (technique) and statistical analysis (tools). Six Sigma methodology aims to complete a process by eliminating defects. The complete concept works on the DMAIC or DMADV approach. Competitive pressure is forcing the Organizations to look for the ways and means to improving their processes so that the Quality of the products and services improve, waste reduces and customer satisfaction increases. In Today’s challenging world you need to make price reductions & create better quality. For that you need proven method for achieving this throughout your company on a rapid, systematic and continuous basis. Our Six Sigma Green Belt Certification Training can result in the kinds of changes you are looking for. Six Sigma seeks to improve the quality of process outputs by identifying and removing the causes of defects (errors) and minimizing variability in manufacturing and business processes. Apply the DMAIC process to Business issues. Quality and Process Managers, Engineers & Executives who need to have a better understanding of Six Sigma and the application of Six Sigma in process/quality improvements. Professionals working in the support functions like HR, Admin, Finance, Purchase, Sales, Marketing, Training, Recruitment, Operations, IT-Support, Travel, etc. 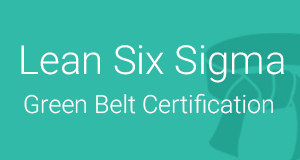 There is no specific prerequisites for Six Sigma Green Belt certification training and examination. Six Sigma – what does it mean? Six Sigma at many organizations simply means a measure of quality that strives for near perfection. Six Sigma is a disciplined, data-driven approach and methodology for eliminating defects (driving toward six standard deviations between the mean and the nearest specification limit) in any process – from manufacturing to transactional and from product to service. Six Sigma Certification can be applied to many aspects of business, and therefore can benefit almost all companies. By enrolling your employees, Six Sigma can drastically improve your organization's bottom line, and at the same time help your employees climb the corporate ladder. Six Sigma has become the flagship method for separating your organization from its competition. The Benefits of Six Sigma Training? The Six Sigma Strategy was originally created by a fortune 500 company as a means to reduce waste and the costs that are associated with developing new products. What the strategy grew to become, after its methods and directives were implemented, is something far more than anyone could have envisioned. The benefits of six sigma training can be proven by corporations and the individuals that have taken the time to obtain the training. Can any project be a Six Sigma project? No. Typically, Six Sigma projects address situations where the cost, quality or delivery of a process is not meetingthe customer needs and the solution is not known. Six Sigma utilizes three methods to manage these projects,DMAIC (Define, Measure, Analyze, Improve and Control), DFSS (Design for Six Sigma) and Lean (Discover and eliminate unnecessary steps within a process). Define: The customer requirements, clarify the problem and set goals. Measure: The current processes and collect relevant data for future comparison. Analyze: To verify root causes and determine the relationship while considering all factors. Improve: To generate and apply solutions. Modify existing processes or develop better processes. Control: By monitoring to assure continued high-quality performance. There is no pre-course work. Does the course fee include the IASSC Certification examination fee also? You will be mailed a Certificate of Completion. The course was very educational and insightful. I liked the flexibility of instructor, adjustment to relevant topics and practical applications. The class was very interactive and informative. I enjoyed learning the methods of Six Sigma. The instructor was able to describe concepts related to our company. Trainer did a great job presenting very complex info in a practical and easy-to-understand way. Great class!! Training was sufficient for green belt. Applicability of concepts to real problems were discussed in detail. I am pleased with the amount of knowledge I gained within four days of class. Our teacher was more than qualified to give us tools we need to successfully pass the certification and implement a new way of thinking into our job of manufacturing. I would definitely recommend this course.